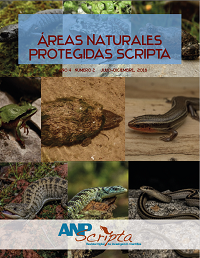 The Journal ÁREAS NATURALES PROTEGIDAS SCRIPTA is an online scientific publication published in electronic format biannually. 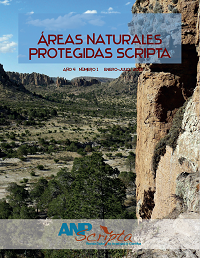 The aim of the journal is to disseminate research articles related to all aspects of Protected Natural Areas. ÁREAS NATURALES PROTEGIDAS SCRIPTA accepts original research papers in the following categories: original journal articles, review articles, and research notes. Contributions on all the various topics and issues that concern the understanding and management of protected areas are considered; these topics include among others (and not restricted to) social, economic, biological, ecological, physical environment, cultural, conceptual, and they can also be multidisciplinary. Manuscripts submitted in Spanish or English language are accepted. Each one of the manuscripts submitted to this journal is sent for review by at least two expert scientists in the field while the identities of both authors and referees are kept anonymous. Final decision on acceptance of a manuscript by the Editorial Board is based on the recommendations submitted by the reviewers.